During the beginning stages of a remodel, Modern Craftsman was approached with designing a fireplace facade, a floating staircase, and railing to accompany the staircase. The location was a house above Foothill Drive in Salt Lake City, Utah. The homeowners requirements were that the facade would not include stonework or tile, due to the segmented look of those materials. The clients desired a more cohesive look to the facade, and one that didn’t show any adjoining seams on the corners of the feature. The fireplace sat in the middle of a spacious living room that included floor to ceiling windows overlooking the entire Salt Lake Valley. It’s a beautiful area to see incredible sunsets. When working with the homeowners to tackle our approach to the fireplace, my immediate thought was to create a design that incorporated horizontal lines to lead the eye around the room and, therefore, around to the views of the valley. The solution was OrganiCrete® paneling with monolithic corners to address the no-seam corners the clients requested. I suggested we cast all panels and composed their placement on the feature after the fact. The slight variance in each casting's hues would incorporate a composition that provided a harmonious finish, which would combat the modular "chunks" of color that tile and stonework often display in terms of aesthetics. The clients' original thoughts about the staircase was to include a singular beam for support. In looking at nature of the composition of that space, I realized users would peripherally experience a wall on their left with an open railing on the right. I voiced my concern with the singular support beam from the vantage of the end user: it could give a bit of a strange feel, almost like a user's equilibrium was off. I suggested two support beams to provide the user with a more balanced feel while ascending the stairs. The homeowners were excited about an OrganiCrete mixture that utilized a finer sand for a smoother finish, so I suggested I place a slight texture in that casting to give the stairs a little bite to the read. When it came to the railing, the clients knew the wanted a dark color that wasn't monochromatic. Knowing Ironclad would be a great solution, I went with a hand rubbed patina to darken the material and also provide a more organic visual movement to offset the otherwise stark, monochromatic nature of the steel. Steel posts were anchored directly into the hardwood floor rather than to a baseplate thatâ€™s fastened to the floor for a clean look that didn't impede traffic. 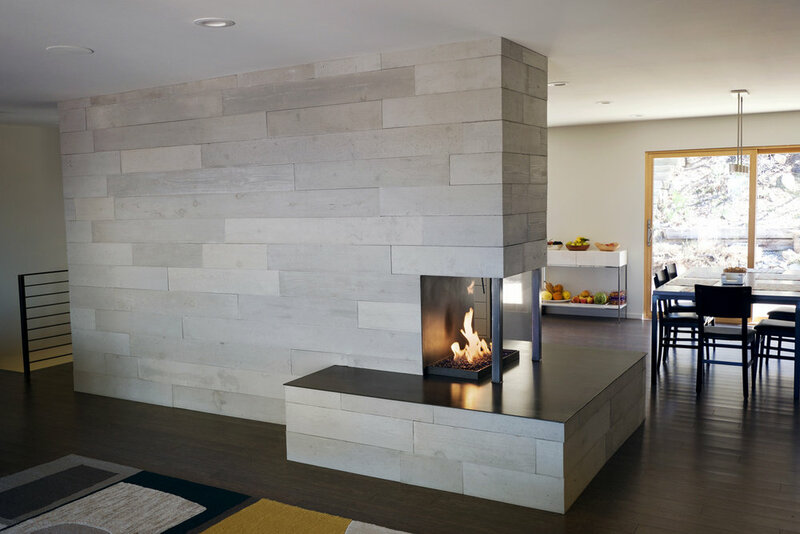 The paneled OrganiCrete fireplace provided the perfect aesthetic feature, aiding in a cohesive experience of the Salt Lake valley views. The pre-cast, monolithic-cornered panels gave a beautiful, congruous end result, fulfilling the clients' need of balance and consistency. The Ironclad railing not only worked well for traffic through the area, it solved the requirement of a dark material with interesting, subtle patterns in the finish. The floating staircase showcased a grand entrance to the lower level and left the user feeling balanced and safe while ascending. The clients couldn't have been more satisfied with the collaborative process, solutions presented, and results of their custom Modern Craftsman triple-threat project. Ironclad was utilized in this custom railing that was mounted straight through the flooring, rather than to a plate that adhered to the floor. Ironclad was used in two support beams to center the concrete staircase in relation to the walls that surrounded it on the floor above.